I am excited to have Electronic Design as our partner in the Middle East, and look forward to our mutual success and rapid growth in this market. 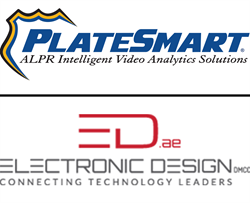 As a result of its unprecedented growth, PlateSmart, the industry-leading manufacturer of ALPR-based video analytics, has opened its first office outside the United States in Dubai, U.A.E. A joint venture with consultancy partner Electronic Design DMCC, the office will provide more direct access to the Company’s award-winning video analytics solutions based on Automatic License Plate Recognition (ALPR) for governments, security agencies, and sensitive private enterprises in the Middle East region. The partnership between PlateSmart and Electronic Design was first revealed at Intersec 2016, where Electronic Design impressed audiences with a demonstration video of PlateSmart’s ARES fixed video analytics solution. “We are always pleased to bring to the Middle East the latest and most advanced technologies. PlateSmart’s ARES ALPR solution will help our customers across the region increase the level of security across cities and critical areas. We are excited to introduce that partnership and look forward to a great 2016 based on a lot of positive feedback during the Intersec show in Dubai,” said Paul Rizk, MD of Electronic Design DMCC. Today’s announcement brings with it the prospect of a landmark year for PlateSmart in 2016. In addition to implementing the biggest installation of fixed-location ALPR solutions in industry history, the Company will also be debuting a host of new data gathering and security features for its ARES video analytics platform. Among these will be facial capture technology and a comprehensive audit trail system designed to prevent unauthorized access of stored data.